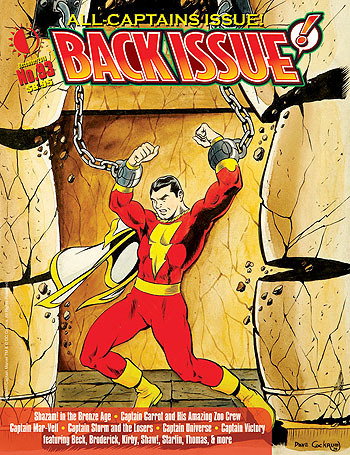 IN PREVIEWS NOW: Back Issue #95, BrickJournal #11, and 45% off this weekend! AND THROUGH MONDAY ONLY: All black-&-white back issues of our magazines, and all LEGO-related publications, are 45% OFF at www.twomorrows.com! Give a great holiday gift, or complete your collection! This entry was posted in TNT on 30 November 2016 by Mr. Morrow. TwoMorrows’ BLACK (and white) FRIDAY SALE is on! 45% off B&W & LEGO® mags! PLUS: All BrickJournal and LEGO-related publications (including our Minifigure Customization and You Can Build It books) are also 45% off! So it’s a great time to stock up for the holidays, as a gift for someone else, or treat yourself and complete your collection! BONUS: We’ve also included all our SCRATCH & DENT items (slightly scuffed or dinged copies of long sold-out books & mags) in this 45% off sale. In many cases, only one copy is left, so don’t delay! The sale is for ONLINE orders only, placed at our website through 12:01am EST on Dec. 5, 2016. It only applies to PRINT copies, but a free digital edition is included where available (except for scratch & dent copies, which are print only). New and upcoming issues are not part of this sale, but are available at our everyday 15% off discount. This entry was posted in TNT on 23 November 2016 by Mr. Morrow. Today is Roy Thomas’ birthday. I won’t be so ungentlemanly as to make mention that he’s 76 today; that would just be rude. But best wished to our friend and fellow TwoMorrows editor! If you missed it, snag those issues before they’re gone! This entry was posted in TNT on 22 November 2016 by Mr. Morrow. O Captain! My Captain! 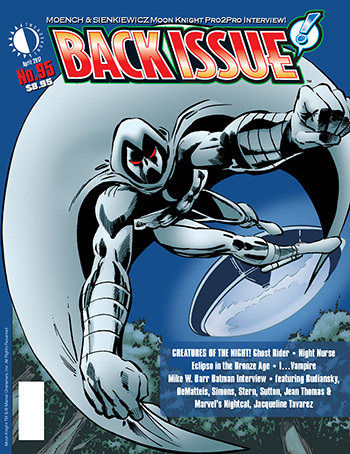 Back Issue #93 ships today! It’s ALL-CAPTAINS (Capt. Marvel, Mar-Vell, Carrot, Victory, etc.) in Back Issue #93, shipping today from TwoMorrows. See a free preview and order the Print or Digital Edition HERE! This entry was posted in TNT on 16 November 2016 by Mr. Morrow. 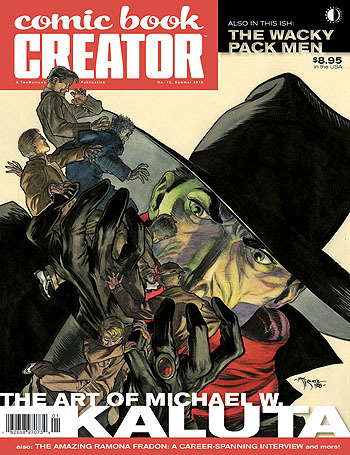 Comic Book Creator #13 ships today, spotlighting Shadow artist supreme Michael W. Kaluta, and the amazing Ramona Fradon, artist on Aquaman, Metamorpho, Super-Friends, or Spongebob Squarepants! And, as if those features aren’t enough, Jay Lynch reveals the Wacky Pack Men, the Topps team who created the MAD-inspired (and subversive) trading cards that influenced an entire generation! Who knows what amazing talents lurk in the comics biz? CBC knows, as does editor Jon B. Cooke. You can view a free preview and order the Print Edition (at 15% off with a free digital edition) or Digital Edition only (just $3.95) HERE. This issue will be in stores on Wednesday, November 23, and ships TODAY directly from TwoMorrows Publishing. This entry was posted in TNT on 15 November 2016 by Mr. Morrow. LEGO® + Education + Robots = FUN! 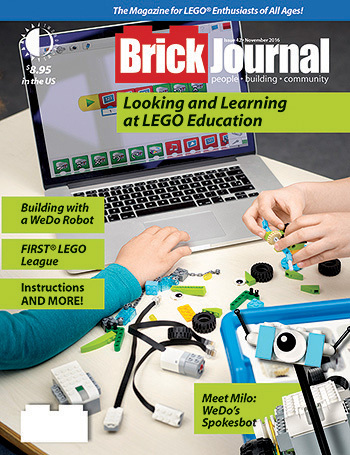 Learning was never more fun than in the LEGO Education issue of BrickJournal (#42), which is shipping today. You can see a free preview and order HERE! This entry was posted in TNT on 2 November 2016 by Mr. Morrow. 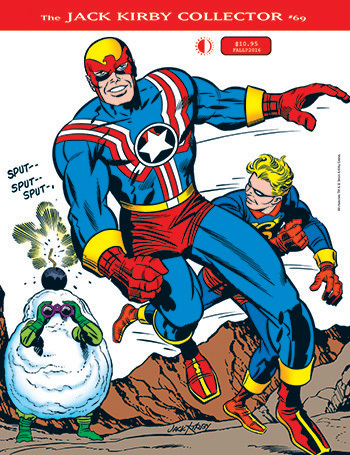 Buddy-up for the “Partners” issue of Jack Kirby Collector! Issue #69 is now shipping, and will be in stores next week! More details, free preview, and ordering info HERE!